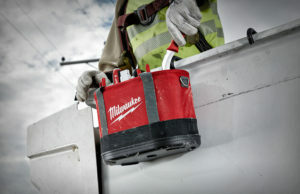 Milwaukee just announced that they will be growing their linemen hand tool offerings with the addition of new Power Utility knives, storage, and pliers. Check out the full press release below for additional info for each new hand tool category They are expected to release January 2019. 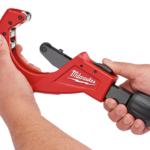 They’re also coming out with new Power Utility Wrenches although we won’t learn more about them until Milwaukee releases more info about. They say they should soon in Spring Time of 2019. The new Lineman’s Hawkbill Knife with STICKWORK™ 3in1 Ring features a blade that has been designed to stay sharper longer when stripping cable. The knife’s STICKWORK™ 3-in-1 Ring makes it compatible with shotgun and universal style hot sticks. This ring also provides an easy way to hang the knife for storage. 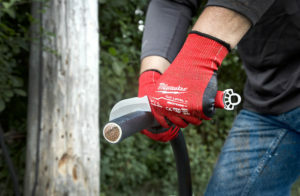 Its oversized handle is designed specifically for comfortable use when wearing utility gloves. Also available is a blunt tip version. The Lineman’s Underground Knife is ideal for splicing multi-layer underground distribution cables. Like the Lineman’s Hawkbill Knife, the Underground Knife features a blade designed to stay sharper longer and, additionally, comes with a durable blade cover that stores in the handle. The handle is built to provide comfortable all-day use and is sized so the knife fits easily into a tool pouch for storage. The Aerial Oval Bag and Underground Oval Bag feature impact-resistant molded bases and are constructed of 1680D ballistic material for up to 5X more durability. Each includes puncture-resistant knife pockets and a wide array of additional pockets for various tool and accessories (24 on the Aerial Oval Bag and 14 on the Underground Oval Bag). Nickel-plated brass eyelets and two D-rings provide additional storage options.Built-in weep holes allow for water drainage after extended use. Each also includes top handles for easy transport to and from the job. The Aerial Tool Apron has 25 custom pockets for a wide assortment of tools and accessories commonly needed during linework including a dedicated flood light pocket, puncture-resistant knife pocket, and magnets to hold sockets in place. A multi-sized auger bit holder is also included and is built to protect against burn-through from hot auger bits. 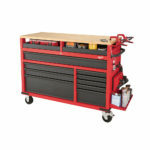 The tool board is constructed of durable vinyl material and features 3 nickel-plated brass eyelets. Built-in weep holes allow for water drainage after extended use. The Canvas Utility Bucket is constructed of reinforced No. 6 double-layered canvas and an impact-resistant molded base for lasting durability and is rated for up to 75 pounds of carrying capacity. A rugged swiveling metal carabiner allows it to clip it into place wherever and built-in weep holes allow water to easily drain. 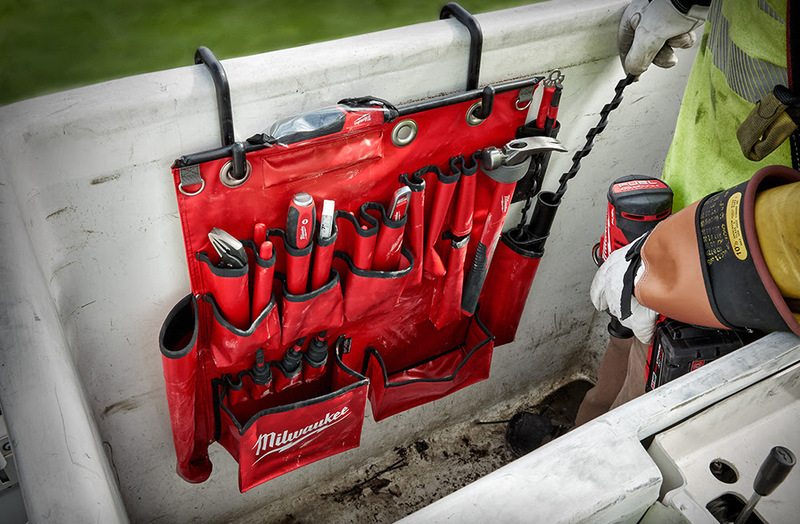 A reinforced ring at the top keeps the bag open so users can easily reach for the tools they need. 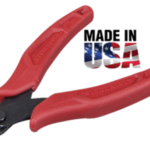 The new High-Leverage Lineman’s Pliers, High-Leverage Lineman’s Pliers w/ Crimper, and High-Leverage Lineman’s Pliers w/ Thread Cleaner are designed from the ground-up to provide maximum leverage and make easier cuts. All feature hardened cutting edges with protection from rust, as well as an optimized pivot design to more easily cut ACSR, hard wire, and soft wire. 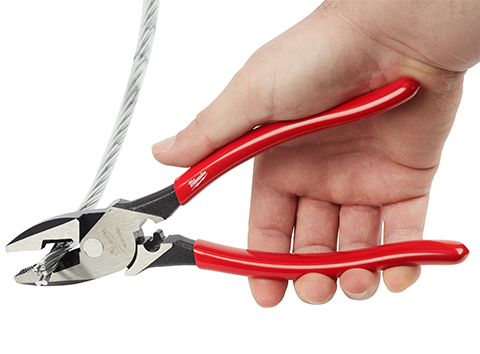 The High-Leverage Lineman’s Pliers w/ Crimper are ideal for crimping insulated and non-insulated terminals, and include an on-board fish tape puller. The High-Leverage Lineman’s Pliers w/ Thread Cleaner are ideal for cleaning pole hardware. A hinge opening on these pliers hold and clean 5/8” (16 mm) pole line, hardware bolts and threaded rod. From the power plant, through transmission and distribution, it is Milwaukee’s goal to improve reliability and productivity for linemen. These new knives, pliers, and storage solutions join a base of Milwaukee® hand tool solutions already used by linemen, including bolt cutters, measuring/layout tools, cut-resistant gloves, and more. In Spring 2019 Milwaukee Tool will add a lineup of Power Utility Wrenches to this family of offerings. Power Utility Wrenches – Coming Spring 2019!